The Gentleman Crafter: Gone Cuckoo of Carriage Clocks! Hello Everybody! Hola Mi Amigos! Did I say I'm going cuckoo over carriage clocks? Well, I mean it! LOL! I've been trying to finish up the carriage clock pattern, working on carriage clocks for gifts, uploading carriage clock pictures and now blogging about carriage clocks! I think one of my gears is missing and my winder is over-wound! Haven't blogged in a couple of days and just wanted to stop in real quick and say I'm still ticking! I'm hoping to have the carriage clock pattern done soon. Need to insert the photos and give it a going over and it will be ready. Thanks for being patient with me. Well, back to the tick tock of the carriage clock! (Whatever! LOL!) Just taking a quick breather and saying hello! See Cait we can make this Beefeaters hat! Now how to make it do something! Some gears maybe? LOL! Love the hat. Did you see the email I sent a week ago about the hat class? I am sure you will think of something to make it do. Think Jack in the Box!! Hey, Jimbo, glad to see you comin' up for some air! Honestly, I envisioned you covered in Dylusion sprays from head to toe...lol. Covered in clock parts instead is even better! It means you are closer to the big reveal. Hopefully you will share pics of your masterpieces. By the way, the hat does resemble a "beefeater" hat a-la-Halloween...my fav time of the year! Glad you could give us a crafty update! yep Sir Jim it is a beefeater guard hat, you should be able to make one as it is a atraight sided brim and sides hat. If you have any clocks cluttering your room you can send me one lol. yep, you should be able to adapt the Beefeater Hat to a Gentleman Crafter Hat...no prob for you!!! !Since you are up to your ears in clocks...how bout making it into a steampunk style with a clock! Would love to see all your carriage clocks lined up like little soldiers!!! Tick tock looking forward to seeing the carriage clocks and pattern. I like Kays idea of a Steampunk style hat with a clock. Then you could make the brim swivel to reveal a circular mini. Whadda ya think? Thanks for checking in. Happy Crafting. So excited every time I visit. Morning caffeine and Gentleman Jim, PERFECTION. Did you finish the lighthouse tutorial? I so want to try to make one? Did I miss it? Oh Jim say it ain't so!!! Glad things are ticking over nicely there! I'm looking out for the lighthouse tutorial too (please save me a copy - pretty please)! I hope you have recovered from your nasty cold now - we can't have our Jimbug with a Jim bug! 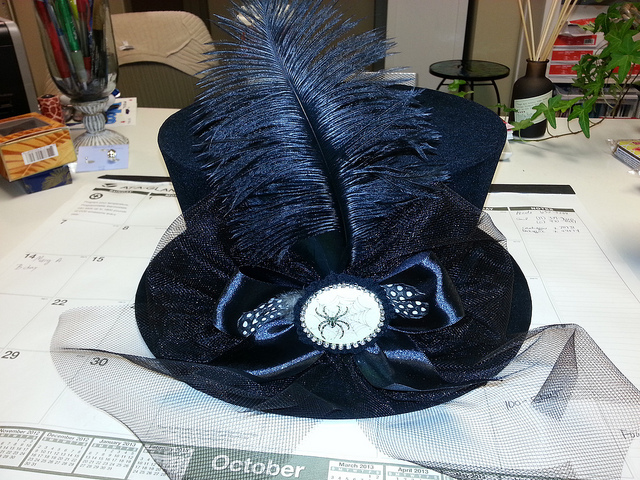 By the time I come up with an idea - you will have already made your hat...inserts and all! Love the hat as is, so anything you do to add to it will look very glamorous and fabulous! Keep the wheels turning! Love the mini in a box on the Graphic 45 website. Any chance there might be a pattern in the future?? Although I suppose I could make it based on the measurements you gave but a pattern sure would make it easier - pretty please! Love the hat. I actually thought you'd made it until I read the blog. Now I've got to find your Youtube channel. I see the brim as the base of a diorama. A fence (rim of the box) to secure the top of the hat (lid). A round mini secured inside the top of the hat? Can't wait to see the clocks Jim. Jim, Jim, Jim, Beefeaters do not have tulle on their hats! Oy! Soooooo Cool Jim. This is definitely you!!!!! 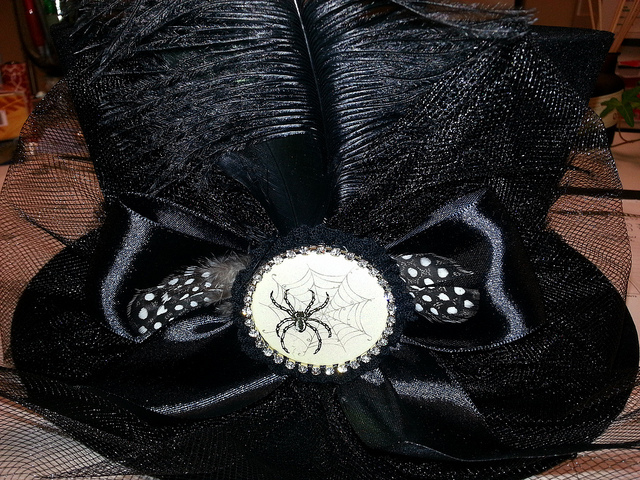 Between the top hat, and the sider and all things halloween, it is definitely you. Can't wait to see your rendition. I know those ole gears are on overload! Loved your G45 project. I have missed you the last couple of days. Can't wait to see what you come up with... it's got your "signature" !